Youth protests against inequality – specifically for free or low-cost education – have led to successful changes in government action, particularly in South Africa. Today marks the 41st anniversary of the 1976 Soweto Youth Uprising and reminds us of the power of young people. South Africa’s environment is conducive to effecting change in government – the constitution protects and enables freedom of association and expression through demonstrations. This however is not the case in neighbouring Zimbabwe. Last year police gazetted a protest ban after unprecedented numbers of citizens, under #ThisFlag, publicly expressed their disappointment with the state of Zimbabwe following years of President Robert Mugabe’s misrule. Under the Public Order and Security Act, marches, community discussions and demonstrations that are deemed to be political are punishable by law. But Zimbabwe’s youth are undeterred, and continue to protest ahead of the 2018 general elections. A young person’s reality in Zimbabwe is one of high levels of poverty and a soaring unemployment rate, compounded by little opportunity to question the government in a free and fair forum. The youth have had enough and are demanding that the government engage its citizens as it seeks electoral reforms. But in the current climate, how can young people in Zimbabwe be empowered to enact change? 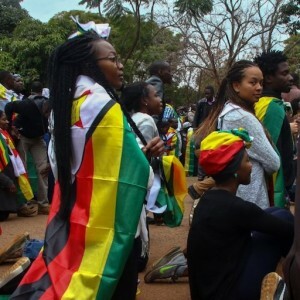 According to news reports, Zimbabwe’s government relies on its youth for political survival, using them as militias during elections to intimidate voters. Zimbabwe’s next elections have the potential to turn violent, and the youth will have to be the positive voice of reason during that time. But as history shows, it is unlikely that the government will use its youth as a positive force for change. Providing young people with job opportunities, capacity building and learnerships to develop skills would probably gain the most traction, and help the youth become a force to be reckoned with. The United Nations (UN) and the African Union (AU) both provide frameworks for the engagement and empowerment of the youth. But whether these can be implemented in Zimbabwe is debatable. Globally, UN Security Council Resolution 2250 urges governments to increase youth inclusion in decision making. The UN has also reaffirmed the youth’s role in peacekeeping and the UN Peacebuilding Fund’s Youth Promotion Initiative is another effort aimed at focusing on youth integration. Organisations like the UN Development Programme (UNDP) already work with the Zimbabwean government on youth empowerment. Success stories include the support offered to the Ministry of Small and Medium Enterprises and Cooperative Development. This has resulted in many young people sustaining better livelihoods through agriculture, and contributes towards skills development and self-employment. Yet such strides are overshadowed by the growing number of unemployed graduates from Zimbabwean tertiary institutions; a clear illustration that more needs to be done. On the continental front, the AU recently developed its Youth Volunteer Corps to provide work experience to young people across Africa. The AU’s African Governance Architecture platform also engages youth to build good governance. These activities point in the right direction but their effectiveness remains to be seen; and making these initiatives work in Zimbabwe will be a challenge. The task will likely fall on civil society. Non-governmental actors – local and international – will need to advocate for better youth civic engagement by implementing programmes (in school and out of school) that focus on home-grown solutions. Programmes should address the lack of skills and encourage social-entrepreneurship opportunities for youth, because this is young people’s key grievance. By developing their capacity, the youth would be less likely to turn to violence out of frustration. Forty-one years on, South Africa’s youth have illustrated that they are still able to influence change through protests. Zimbabwe’s young people should be the leading voice for change in their country – and this can be achieved not only through political processes, but also through their economic empowerment.